In a move to help make Sandy more a destination than a pit stop, the city of Sandy has completely rebranded itself. The "Gateway to Mount Hood" tag line has been replaced with the phrase "Where innovation meets elevation," alluding to the city's efforts to be forward-thinking by establishing its own public transit system and fiber internet. "In 2015 we had a thorough evaluation of our current brand, or lack of brand completed," City Manager Kim Yamashita said. "The findings showed that the business community was concerned that the Gateway to Mount Hood made us look like a pass-through community. We had no logo, but each department had a hodgepodge of looks, fonts, colors and slogans. We had nothing to unify City Services, so much so that some community members were unaware that some of our departments were even city operated." "We asked them to evaluate the slogan as viable," Yamashita said. "In their interviews with citizens, businesses, staff and a large group from outside the community, people when asked, 'What is the main reason you would visit each of these communities?' (they said) 'Pass through, No reason, Shopping, Friends, Restaurants.' Not only are all of our findings by two separate experts driving this change from the unofficial slogan, but when you look at writings by such experts as Roger Brooks, the term "Gateway" is a word that he recommends be avoided. (He says) 'The No. 1 complementary activity of visitors in the world is shopping, dining and entertainment in a pedestrian-friendly intimate setting — your downtown. This is where 80 percent of all non-lodging visitor spending takes place.'" The new logo depicts the city's location between Portland and Mount Hood with an earthy color palette and mountain-and-tree-themed design. The city also created a story to depict how they identified as a community, saying, "For those who appreciate a small resourceful community amidst the splendor of Oregon, Sandy — perfectly balanced between Mt. Hood and the city of Portland — embodies a rare, independent spirit that combines the pioneer and the visionary, and defines the Sandy way of life." The logo has already been applied to polo shirts for city staff, mugs, water bottles, window clings and other merchandise, and it will be used in city paperwork and presentation materials. 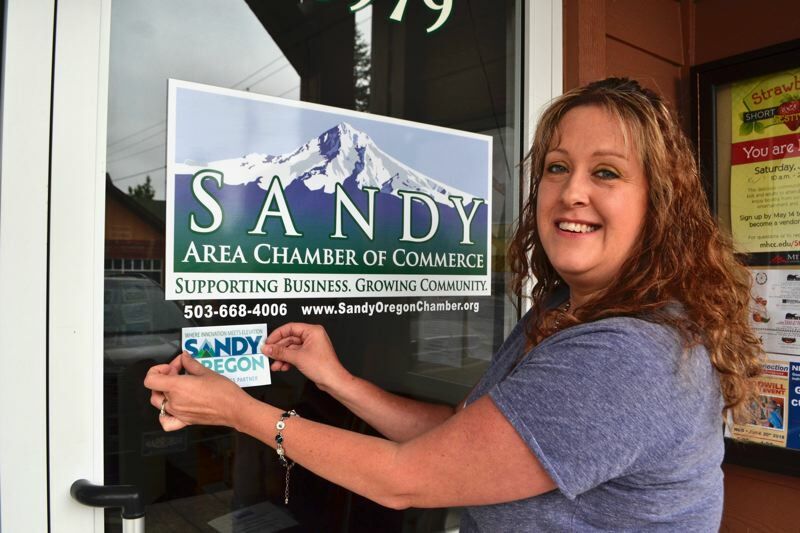 Members of the Sandy area Chamber of Commerce have window clings promoting them as proud partners to depict the collaboration between the city and business communities. "It is important that the city create an atmosphere where we can get visitors driving through to stop, shop and spend money in the community," Yamashita added. "It supports our business both retail and non-retail. Every dollar spent has a value-added of $.60, which means a net profit to the community." Community members have already taken to Facebook to express their disapproval of the new brand. Many say they feel like they were left out of the process and miss the "Gateway to Mount Hood" branding. Several have asked what makes Sandy so "innovative" and said the branding does not fit the community. The city will soon post a web page on its site that will show a timeline of the project and include information about the outreach and public meetings held, the request for proposal, contract with vendors, initial findings and the final reports. Yamashita also will present the new brand at the Grow with Us Sandy Area Chamber luncheon at 11:30 a.m. Wednesday, June 27, at the Sandy Fire Station Annex, 17459 Bruns Ave., Sandy. Non-chamber members are welcome to attend for $15 or attend and have lunch for $30. "No longer will we be a "gateway" to anywhere," Yamashita stated in an email when the brand launched last week. "We are now our own independent destination and worthy of a stop. We want to 'peak' the curiosity of visitors. A place where we can now 'elevate' their outdoor experience or their dining experience, or what have you."